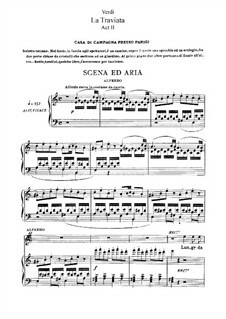 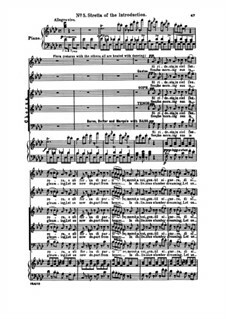 Arrangement for voice and piano of the aria "Dei miei bollenti spiriti" from the opera "La Traviata" written by Giuseppe Verdi. 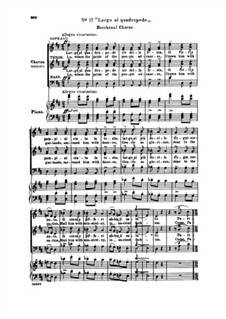 Italian lyrics by Francesco Maria Piave. 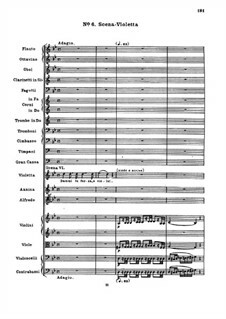 Версия для театральной постановки. 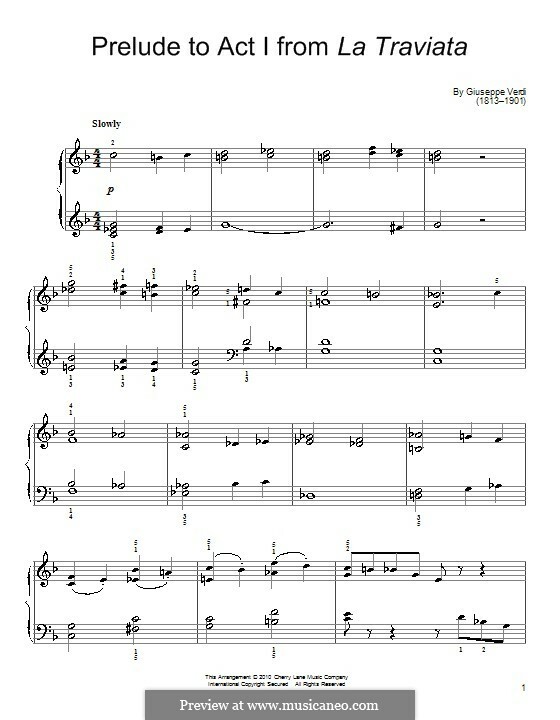 Транскрипция для ф-но. 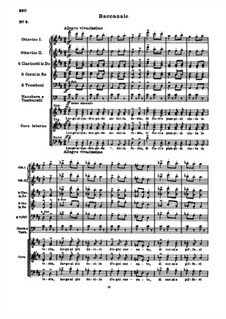 избранных номеров из оперы. 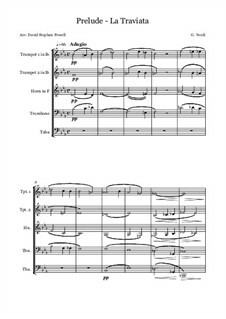 Reworking for flute quartet and cornetta of the most famous themes of Giuseppe Verdi's La Traviata. 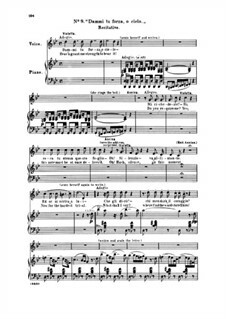 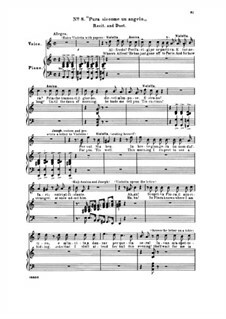 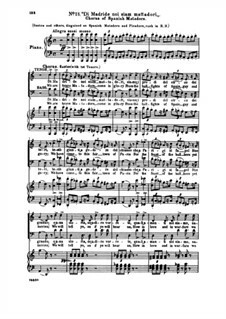 Act I, for soloists, choir and piano Arranged by Tours B. 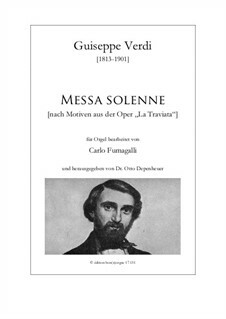 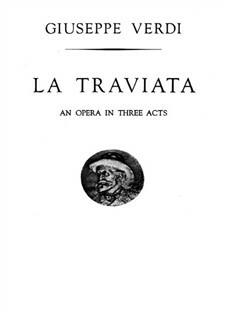 Act II, for soloists, choir and piano Arranged by Tours B. 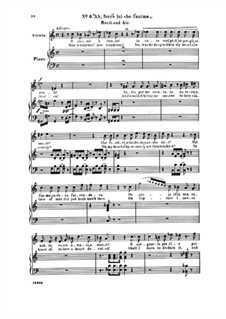 Act III, for soloists, choir and piano Arranged by Tours B. 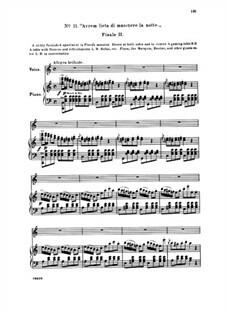 Act I No.1 Prelude, for piano Arranged by Tours B. 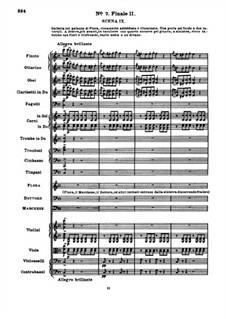 Act I No.2 Dall' invito trascorsa è già l'ora, for soloists, choir and piano Arranged by Tours B. 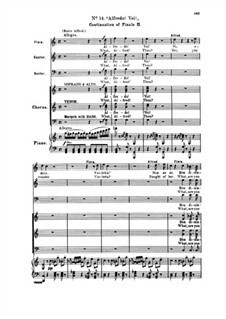 Act I No.4 Un dì felice, eterea, for soloists, choir and piano Arranged by Tours B. 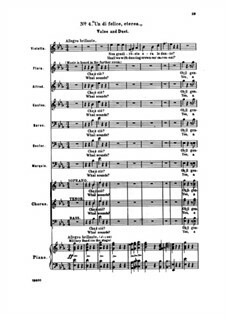 Act I No.5 Si ridesta in ciel l'aurora, for soloists, choir and piano Arranged by Tours B. 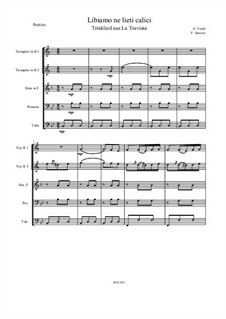 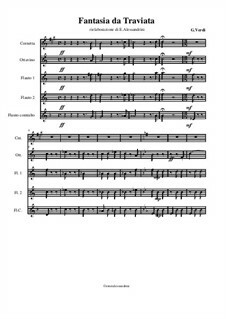 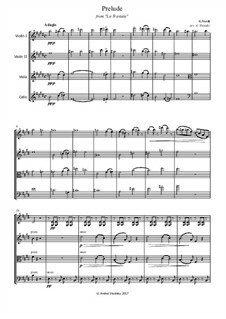 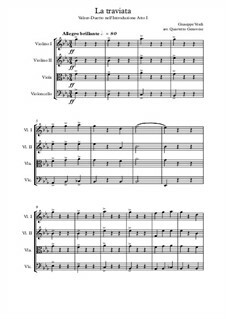 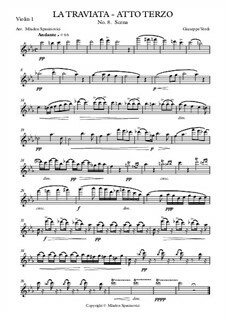 Act I, Valzer, for string quartet Arranged by Cristian B. 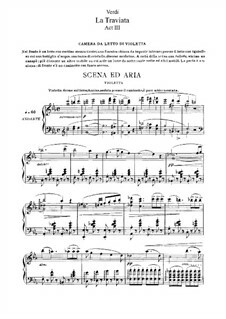 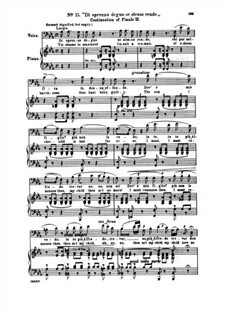 Act I No.6 Ah, fors' è lui che l'anima, for voices and piano Arranged by Tours B. 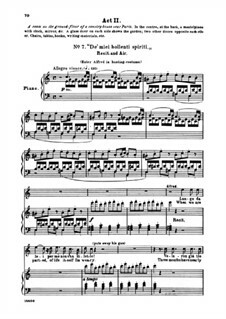 Act II No.7 De' miei bollenti spiriti, for voices and piano Arranged by Tours B. 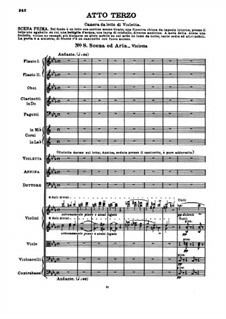 Act II No.8 Pura siccome un angelo, for voices and piano Arranged by Tours B. 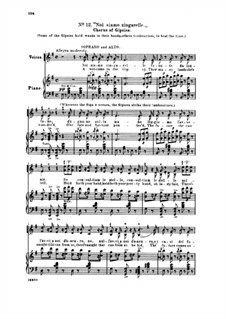 Act II No.9 Dammi tu forza, o cielo, for voices and piano Arranged by Tours B. 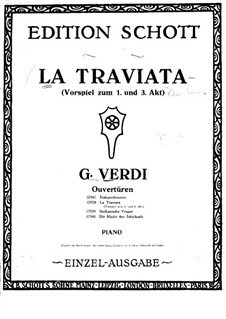 Act II No.11 Avrem lieta di maschere, for voices and piano Arranged by Tours B. 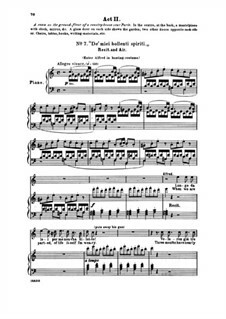 Act II No.12 Noi siamo zingarelle, for soloists, choir and piano Arranged by Tours B. 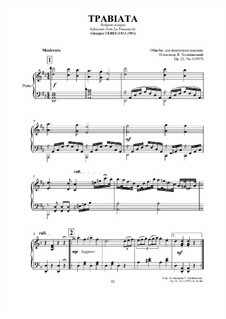 Act II No.13 Di Madride noi siam mattadori, for soloists, choir and piano Arranged by Tours B. 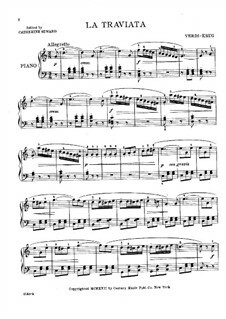 Act II No.14 Alfredo! 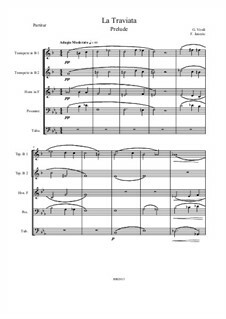 Voi!, for soloists, choir and piano Arranged by Tours B. 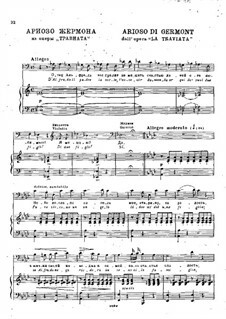 Act II No.15 Di sprezzo degno se stesso rende, for soloists, choir and piano Arranged by Tours B. 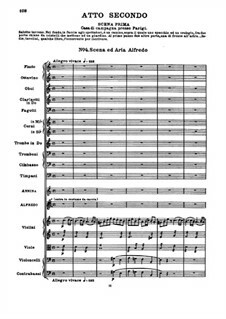 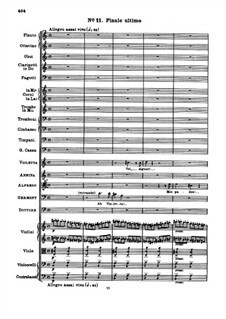 Act III No.8, for string quintet Arranged by Spasinovici M.
Act III No.17 Largo al quadrupede, for choir and piano Arranged by Tours B. 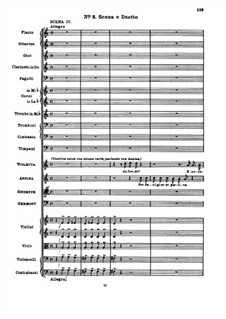 Act III No.19 Prendi, quest' è l'immagine, for voices and piano Arranged by Tours B.
Prelude, for wind quintet Arranged by Powell D.S. 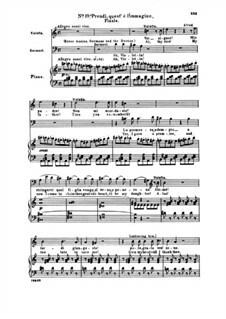 For piano Arranged by Krug D.
Andante. 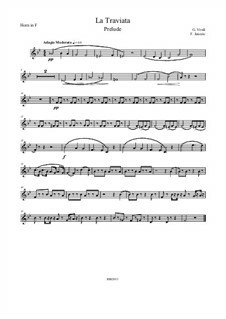 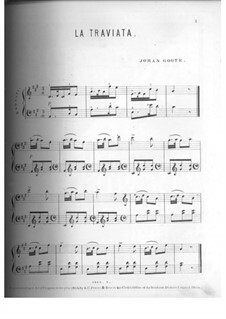 Arrangement for piano Arranged by Goote J. 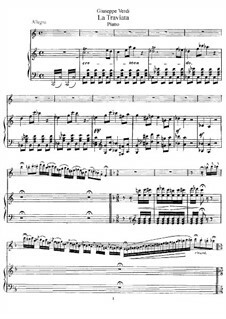 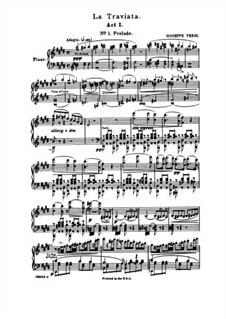 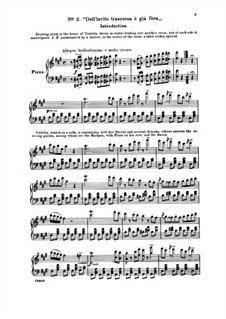 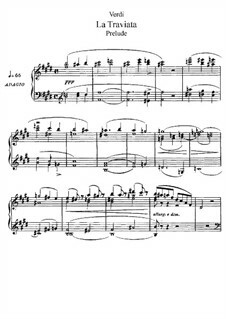 For piano, Ор.23 No.1 Arranged by Khodakovsky A. 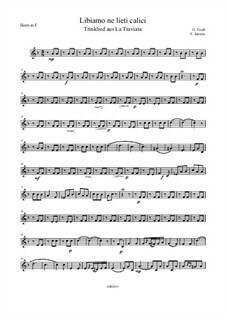 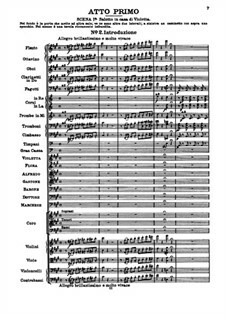 Fantasy, for wind instruments Arranged by Alessandrini E.
Fantasy, for wind instruments (only cornet) Arranged by Alessandrini E.
Fantasy, for wind instruments (only flute 1) Arranged by Alessandrini E.
Fantasy, for wind instruments (only flute 2) Arranged by Alessandrini E.
Fantasy, for wind instruments (only piccolo) Arranged by Alessandrini E.
Fantasy, for wind instruments (only alto flute) Arranged by Alessandrini E.
Fantasia, for piano, flute, violin 1 e 2, chitarra Arranged by Alessandrini E.
Fantasia, for piano, flute, violin 1 e 2 e guitar (only piano) Arranged by Alessandrini E.
Fantasia, for piano, flute, violin 1 e 2, guitar (only flute) Arranged by Alessandrini E.
Fantasia, for piano, flute, violin 1 e 2, guitar (only violin 1) Arranged by Alessandrini E.
Fantasia, for piano, flute, violin 1 e 2, guitar (only violin 2) Arranged by Alessandrini E.
Fantasia, for piano, flute, violin 1 e 2, guitar (only guitar) Arranged by Alessandrini E.
Prelude, for string quartet Arranged by Visotsky A.
Messa solenne Arranged by Fumagalli C.
Prelude, für Brass Quintett – Parts Arranged by Janezic F.
Prelude, für Brass Quintett – Partitur Arranged by Janezic F.
Trinklied, für Brass Quintett – Partitur Arranged by Janezic F.
Trinklied, für Brass Quintett – Parts Arranged by Janezic F.